Penthouse at 70 Park Avenue in New York. It’s not often that I extol the virtues of chain hotels. But I have never stayed at a Kimpton that didn’t meet my high standards. I love their excellent staff, attention to detail, quirky décor, and yes, those signature animal print robes. Add in free wine in the evening and I’m sold. 70 Park Avenue is a welcome addition to the Kimpton group. Conveniently located on quiet 38th Street, the hotel reaps the benefits of its midtown location, without the hustle and bustle. While there isn’t a restaurant in-house, the neighborhood options are plentiful. And, the recently opened lobby-level Silverleaf Coffee & Tea, offers beverages, baked goods and light fare. King Deluxe room at 70 Park Avenue, a Kimpton Hotel in Manhattan. My room had everything you would want in a hotel accommodation: very comfy bed and pillows, a sleek bathroom with a shelf for stuff (that seems like a given, but actually in today’s renovations, some hotels are forgetting about practicality and going for a minimalist look), and a wardrobe instead of a closet. There was ample good lighting and an electrical outlet in the nightstand. Hurray! Someone used their head and realized that we want to plug in our devices next to the bed, not across the room. When I rode the elevator the next morning with a couple of adorable four-legged guests, I realized that 70 Park was pet friendly – no extra fees or size restrictions. All in all, 70 Park Avenue is a place to put on your short list for the family coming into town for the holidays. It’s cozy, friendly and stylish. For more information, see 70parkave.com. Right on, Shari. 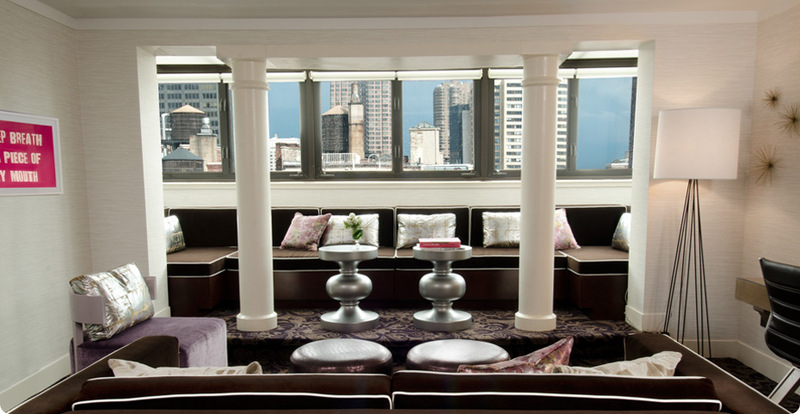 And here’s what I love, too: Kimpton Hotels tend to reflect the place where they’re built. In fact, many of the Kimptons, like the Fairmonts, occupy historic buildings. Even when they don’t, though, if I’m at a Kimpton in New York or Portland OR or Miami, I never get the sense that the place feels like Idaho or Ohio. Normally I do not write comments but in this case I completely disagree. Have loved Kimpton for a long time a cool boutique hotel next to a great restaurant was the way the started back in the day in my home town San Francisco. My wife and I stayed there this summer for 5 nights in a deluxe room. Had Stayed at the Hudson previously and told people it reminded me of an upscale dorm room. This room was the same size, without the minimalist decor room it felt smaller. The bathroom was a joke the shelf held my shave kit my wife had her stuff on the desk in the room. The first night we did an after hour mini-bar raid and our party of 4 was tight but in our friends standard room the soiree would have been impossible. The mini bar fridge broken and the ice is “conveniently located on the second floor” we were on the 7th. Fridge never got fixed we stopped calling on the 3rd day. One of the two elevators was broken for our entire stay and the hotel was full. I should probably take the stairs but five times a day got real old real fast. The restaurant was shut and the bar hours were only at happy hour. it was not being renovated. All and all a major pass. I’m sorry you had an unfortunate experience at 70 Park. It’s so frustrating when two people view the same hotel, restaurant or tourist site differently. But I can assure you that Park 70 was every bit as wonderful when I stayed there as I stated. Yes, the restaurant had closed – permanently. The space has since reopened as Silverleaf Coffee & Tea, but the area boasts many fine dining choices. As a rule, whenever an accommodation is not up to snuff, speak up! First try the front desk personnel and if you don’t get satisfaction, ask for a manager. Elevator malfunctions and closed restaurants are mostly unavoidable, but I’m sure management would have taken care of your fridge. Don’t give up on Kimpton…they are a great alternative to the big box chains. Penthouse at 70 Park in New York.